I'm Going To Drive In The Mille Miglia! Those of you who may have noticed me eating a bowl of dry cat food and milk this morning may come to the reasonable conclusion that I’m pretty distracted. This time it’s not because I drank more of that blue liquid I found behind the furnace, it’s because tomorrow I leave for Italy and the Mille Miglia. And I’m very excited. 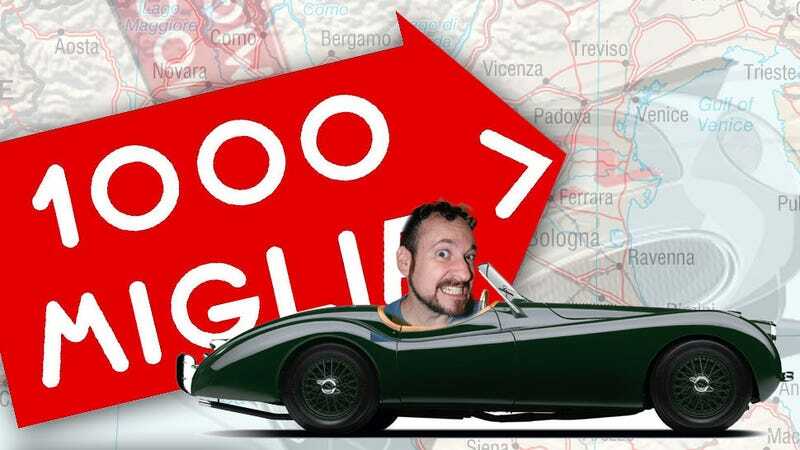 Thanks to Jaguar, I’ll have a chance to drive in the legendary Mille Miglia — the name, I believe, translates to “1000 Migglias” and, as we all know, a “migglia” is a legendary Italian enchanted worm that’s one mile long. A 1000 mile-long worms are, of course, 1000 miles long, which is the length of the endurance race. Hence the name! The more you know, right? The Mille Miglia was run 24 times between 1927 and 1957, with a little break taken in the middle there for everyone to kill each other during WWII. All the big European companies made some amazing cars for the races: Alfa Romeo, BMW, Maserati, Ferrari, Mercedes, Porsche, all the good stuff. Eventually, though, the race ended up killing 56 people – both spectators and racers – over the decades, and it was decided that it’d probably be best to call it finished. Even so, nothing’s ever really over, and the Mille Miglia was re-started in 1977 as what’s called a “regularity race” for classic racecars of the era. Only cars made up to 1957 that were originally registered for the race can enter, and the route is the exact same, a big loop from Brescia to Parma to Rome and back. A ‘regularity race’ is a sort of less-murderous rally where the goal is to drive through the segments in a specified time and maintaining a specified average speed. It sounds like something I’d be terrible at, so it’s probably good I’m not really competing. I will be driving a Jaguar XE for much of the race, and I was promised a chance to drive one leg in a Jaguar XK120 — I’m very excited for that. I’ll also try and see if I can get into anything else while I’m there (Piaggio Ape, maybe?) because why the hell not? I have no idea how this will play out, but we’ll see. What I do know is that I’m going to be in some beautiful country, surrounded by some stunning vintage racing cars, and I’m absolutely delighted. I’ll try and keep everyone updated, and I suspect Jaguar will be requesting that I install an in-car urine system in the XE — I’ll let you know how that goes, too. My one issue is that I’m moving into a new house this month and because I’m leaving at this not-really-ideal time, it’s possible my wife will kill me. So, provided I make it through the night without being suffocated in my sleep, I’ll be in Italy sometime tomorrow, and as always I’ll do all I can to let you know what’s interesting. Anyone ever run the Mille Miglia? Any tips? Anything exciting I should try and show you? I’m listening!